the outrage and anger over the "allegedly" rigged election is understandable. however we are getting the commnets from facebook nd twitter and taking them as if they are actual facts and truths. we are also getting the perspectives of a segment of the population that is more affluent and has access to things like facebook and twitter.what about millions of iranians that live in the rural areas who don't have access to the internet who voted for ahmadniejad. 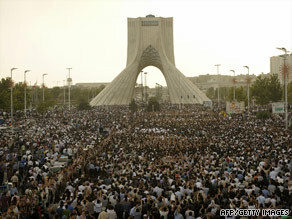 we keep getting the view from only tehran of a few hundred thousands people out of millions. would we be covering this issue in the same manner if it was ahmedinjead's supporters were doing this?? lots of good reporting/recounting from reports on the ground. who's to say ahmedinejad's suppporters aren't tapping in to social media. the presumtion that this is limited to a section of the demographic is incorrect. everyone and their mother has a cell phone and most people have cell phones with camera's and new technologies, even if they are dirt poor and can't afford to pay for their dinner in the days upcoming. the movement/this dissent is from the wealthy straight to the peasants. i hope western media are being dillegent like what octavia was saying the other day and using trusted sources and verifying information. good reporting from cbc, and lots of on the ground local reporters who are endangering themselves once they open their mouths to talk. also noticing the first person accounts beying relayed through social platforms via the net, which is making traditional news look outdated/not quick enough to be in the know. The security services of Iran are hard at work spreading FUD and disinformation, I see. Oh lets see, how about the fact that its another 3rd world armpit, with the same 3rd world problems. Too many people, not enough food, no birth control, religion clashes that are as old as the Bible, and the USA Sticking their nose in where it does not belong. Sounds like another Iraq War waiting to happen. How about, let that country destroy itself, just like the others need to do, and our current White House Administration concentrating on getting our problems resolved instead of pledging more un-necessary and undeserved money to a country that does not deserve any of it. Hmm, where is the common sense here. Have we actually lost all of the smart people in this world? Looks like it to me. I think I am going to run for President in 2012. I may be an unknown, but I have a plan. That plan is USA First! Foreign Policy second. NATO third, United Nations fourth, and the third world, well you guys are at the bottom of the list. I'll get to ya when I can! Hmm, that would be NEVER!